Check out David's very own Author and Historian website here. You'll be £12.99 closer to your next £10.00 credit when you purchase Edward IV and the Wars of the Roses. What's this? Order within the next 4 hours, 16 minutes to get your order processed the next working day! 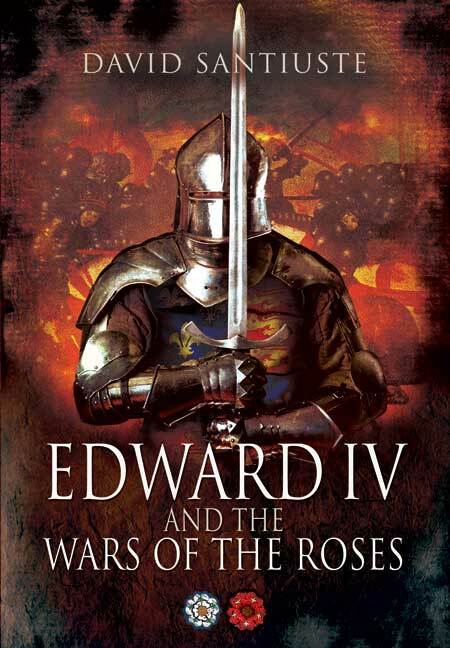 Indisputably the most effective general of the Wars of the Roses, Edward IV died in his bed, undefeated in battle. Yet Edward has not achieved the martial reputation of other warrior kings such as Henry V – perhaps because he fought his battles against his own people. It has also been suggested that he lacked the personal discipline expected of a truly great commander. But as David Santiuste shows in this perceptive and highly readable new study, Edward was a formidable military leader whose strengths and subtlety have not been fully recognized. On the battlefield he was an audacious soldier, fighting like a lion to defend his rights, although he also possessed a cool head that allowed him to withdraw when the odds were against him. His court was a centre of chivalry, but he did not seek military glory for its own sake. For Edward, warfare was always a means to an end - indeed he often preferred to forgive his enemies rather than destroy them. And yet, in 1461 and 1471, he waged two brutal and relentless campaigns, crushing all the opposition in his path. David Santiuste's reassessment of Edward's military role, and of the Wars of the Roses in which he played such a vital part, gives a fascinating insight into Edward the man and into the politics and the fighting. Based on contemporary sources and the latest scholarly research, Edward IV and the Wars of the Roses brings to life an extraordinary period of English history. A readable, easy way to follow the ups and downs of the conflicts, skilfully using contemporary and academic sources [...] Overall, this is a fine study of the Wars of the Roses that focuses on Edward IV and military operations. Altogether, this well-researched, cogently argued and eminently readable account paints a vivid picture of Edward IV as a courageous and able soldier, capable of utter ruthlessness when the occasion demanded. A convincing, well-argued portrayal of one of England's most talented but perhaps least appreciated kings, focusing on his skills as a battlefield leader, an area in which he excelled. A valuable and thought-provoking addition to the canon, which ought to become required reading for anyone interested in the reign of the first Yorkist monarch. A pleasing and well-informed appraisal of the first Yorkist king. Santiuste provides a clear and cogent survey of the battles that put Edward on the throne, and the ones that kept him there. David Santiuste's work demonstrates that Edward's record as a commander and leader of men equals [that of] the more accepted warrior princes of the Hundred Years War. The author has been careful not to be distracted from his main theme, while also placing Edward's actions in the context of his policies, both at home and in a wider Europe. A worthwhile read. The Wars of the Roses encompassed many of the most bloody confrontations of the Medieval period such as the Battle of Tewkesbury. What led to this massive outpouring of conflict? Edward IV was very much the most effective general of the whole period and died, undefeated in battle. What were his secrets of success?David Santiuste has undertaken a major study of this man; and reassessed his place in history. He looks the exact role played by Edward IV and his political acumen, as well as his military skills. Santiuste believes that Edward was a formidable military leader whose strengths and subtlety have never before been fully recognised. It makes interesting reading, throwing new light on a period of history about which most people know very little. This is a book for anyone interested in the medieval period or who enjoys biographies. It is detailed, well researched and well written. Not easy reading, it requires concentration but is a book that is definitely to be recommended. 4 stars. His work shows exactly why historical biographies are vital in engaging enthusiasts, novice or professional. Santiuste incorporates new research as well as expounding new theories to retell a story that has become predictable in traditional retellings… Santaiuste’s biography is perfect for those who wish to look further into the reign of Edward IV. The references and bibliography he provides facilitate this further exploration nicely. If that isn’t a clear characteristic of a good history book, I don’t know what is. David Santiuste's interest in history was first inspired when he was a child, growing up in Yorkshire, visiting castles and churches with his family. He went on to study at the University of St Andrews, where he continued with postgraduate research. He currently teaches history at the Centre for Open Learning, University of Edinburgh. David is the author of two books: Edward IV and the Wars of the Roses and The Hammer of the Scots. His other publications include contributions to Medieval Sexuality: A Casebook and Medieval Warfare. He is the creator, with Rae Tan, of the website Reflections of the Yorkist Realm (yorkistrealm.com).